In Seine-Saint-Denis, the residential sector is the most energy-intensive sector after transport. To meet its objectives to halve energy consumption and to cut its greenhouse gas emissions by a factor of four by 2050, the department is looking to implement a massive thermal renovation project for existing buildings. However, households who would like to invest in the renovation of their homes face a set of challenges. Habitat 93 seeks to respond to the expectations of individuals and professionals by offering them support services. For individuals, Pass’Réno Habitat 93 guarantees a single contact throughout the whole energy renovation process. For professionals, Pass’Réno Habitat 93 offers new development opportunities and the strengthening of the training system. Finally, the scheme includes the creation of an observatory of local practices and energy usage monitoring, serving all local public policies. Households, be they homeowners or landlords, are accompanied throughout their renovation plan. One of the system entry points is the local network of PRIS (Point Rénovation Info Service). The PRIS provide free, neutral and independent advice to guide individuals onto the appropriate path. 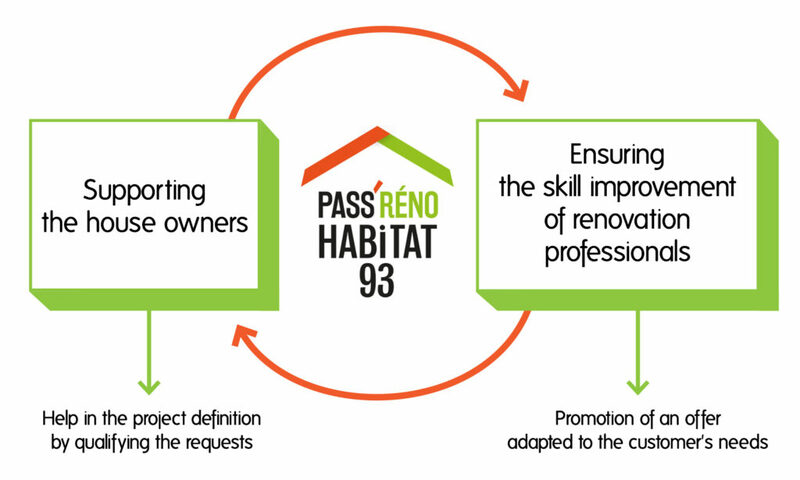 Based on an initial review of the situation, Pass’Réno Habitat 93 supports owners by providing specifications, help and FAQs, a financing plan, quality monitoring, and an assessment of the work’s effectiveness. The objective is to encourage the renovation of 30,000 housing units in less than 20 years, which represents 20% of the target for individual homes in the department. To this end, Pass’Réno Habitat 93 provides support for the entire sector (SMEs, small businesses, construction workers, technical consultants, architects, and financial services firms). It aims to improve the skills of green renovation artisans and local companies, promoting new jobs and businesses. Driven by local actors, Pass’Réno Habitat 93 has been designed and put forward by MVE and Agence Locale de l’Energie et du Climat de l’Est Parisien (ALEC), in response to the first call for expressions of interest launched by the Region Ile-de-France and ADEME (Agency for the Environment and Energy Management) for the creation of local platforms for energy renovation. The project is supported by the County Council of Seine-Saint-Denis and three urban communities – Est Ensemble, Plaine Commune and Terres de France – in coordination with the local energy agency of Plaine Commune (ALEC), building federations, and the CAUE 93 (Council for Architecture, Town planning and the Environment). In December 2015, the Seine Saint-Denis Department (93) will host the 21st UN Climate Conference (COP21). The Department wants to act at all scales, from global to local. Pass’Réno Habitat 93 is an example of local territories getting involved in the ecological transition without waiting for the release of an international agreement, paving the way toward a low-carbon economy.